At the Top of Squirrel Spur: I *Heart* Spidey! Oh, I like Spiderman, too; what other comic book hero is there for a hand spinner? But I adore the Spiderweb Cardigan pattern. 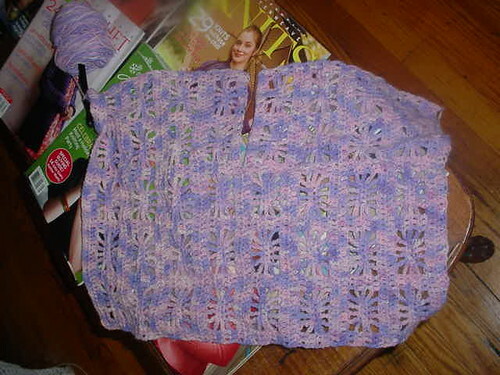 Crocheting is flowing along smoothly, despite lapses of attention and lots of customers over the weekend! I was very happy to be able to add some spinning, knitting, dyeing, beading and crocheting titles to the shop's stock this past week. Already the books are selling. I think my personal favorites in this shipment are Scarf Style by Pam Allen and Spin to Knit by Shannon Okey. Two more titles are on the way, though, and one is all crochet. And I went through last night and cleaned out some of my book stash. When I first discovered the Internet and fiber festivals I went a little crazy buying spinning books. A lot of these titles are no longer available. 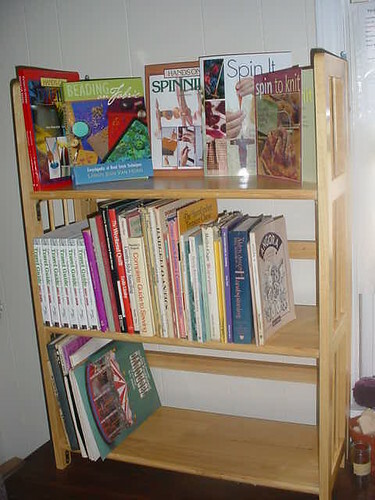 Of special interest is Erica Lynn's Angora: A Handbook for Spinners, pictured at the end of shelf two for those in the know. There are also books on quilting, embroidery, cross-stitch, quilling and other subjects. If they don't all sell by the end of our season here, I'll be putting them on the Internet.